While the C-130 revolutionized airlift, the C-141 STARLIFTER put the "military" in Military Airlift Command. Prior to the advent of the C-141, MATS, the forerunner of MAC, had been essentially an airline in military garb, with some tactical capabilities. The C-141 changed all of that, because it gave MAC the ability to move men and equipment over long distances and deliver them into combat by parachute if need be. While the C-141 came about due to the efforts of leaders of MATS, it was actually the fruition of a concept stated almost two decades before by a World War II troop carrier commander, General Paul Williams. General Williams, who commanded the Tactical Air Command, felt that the United States needed a long-range troop carrying cability and said so at the end of the war. 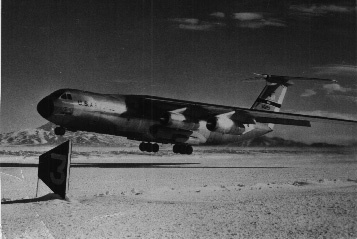 The C-141 was developed during the early sixties, and entered service with MATS in mid-1965, only a few months before the creation of the Military Airlift Command. The jet transport came on the scene just as the United States was escalating its role in Vietnam, and soon the T-tailed transports were burning holes in the sky between the United States and Southeast Asia. Throughout the Vietnam War, a steady stream of C-141s was in the air constantly between MAC bases on both coasts and airfields in Vietnam, with enroute stops in Alaska, Japan, Hawaii, Okinawa, Guam and the Philippines. While most C-141 flights carried cargo, on occasion the STARLIFTERs were used to transport combat troops and their equipment to the war zone. Perhaps the most important contribution of the C-141 to the war in Vietnam was the evacuation of casualties to the United States. Thanks in part to the high speeds of the C-141, many American troops survived the Vietnam War after suffering wounds in combat. When the American POWs were released in 1973, they came home in C-141s. In October, 1973 the MAC C-141 force was put to work in OPERATION NICKEL GRASS , the airlift of supplies to Israel during the Yom Kipper War. While C-5s transported half of the cargo carried during the airlift, C-141s did their share. As as a result of the operation, the entire C-141 fleet was up-graded to B-model status as their fuselages were lengthened and aerial refueling capabilities were added. C-141s remained as the "workhorse" transport of the United States airlift forces, which is now designated as the Air Mobility Command, until the mid-2000s when the last one was retired. 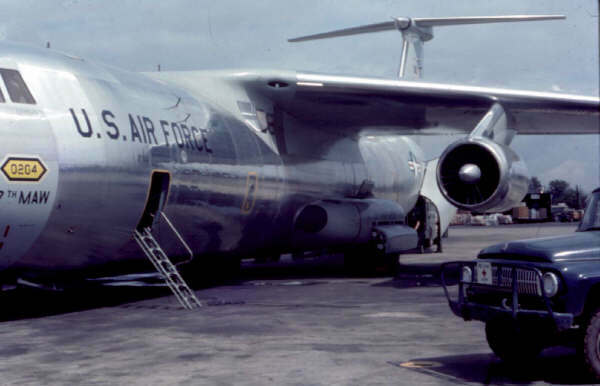 C-141s played a major role in the invasion of Grenada, while they made their first combat drop of paratroopers during Operation JUST CAUSE in Panama. Along with C-5s, C-141s were instrumental in the American buildup in the Middle East during DESERT SHIELD, the build-up for the Desert War. In the 1980s, many C-141s shifted to reserve forces. The C-141 was replaced with a new generation airlifter, the McDonnell-Douglas C-17.